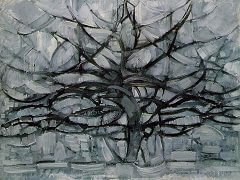 The Gray Tree is one of the first paintings in which Mondrian applied to a natural subject the principles of cubist composition that he was in the process of assimilating and working out in his own way. 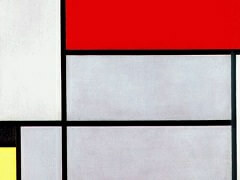 At the same time, it is a continuation of the series on the Tree theme, which began with the studies for the Red Tree of 1908. Although four years elapsed between the Red Tree and the The Gray Tree, it would be a mistake not to see them as two links in a single chain of development. 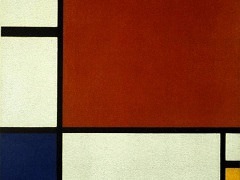 Actually, there are a few additional links in the chain connecting the luminist version of 1908, with its bold red and blue, and the cubist one of 1912, in which color has receded almost completely, and form and rhythm dominate. 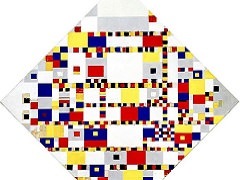 These additional links date from Mondrian's Zeeland period and comprise a number of little works that reached a highpoint in the Blue Tree, probably created in 1910, the same year in which other motifs - dunes, mills, church facades - similarly acquired a character of their own. 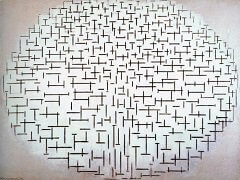 In 1912, or perhaps as early as the winter of 1911/12, Mondrian came back to the theme of trees in a large drawing in black chalk, in which his unmistakable aim was to bring the three-dimensional volume of the bare tree, with its twisted branches, onto the surface of the picture, into the second dimension. 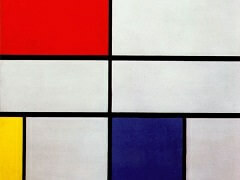 His project was to transform the thing that he saw in front of him into a rhythmic sign on his sheet of paper. This drawing became the starting point for at least three paintings: the The Gray Tree reproduced here; a closely related canvas, somewhat more oblong in shape and thus a little closer to the drawing; and the Flowering Apple Tree. It seems evident that the process which took place between the large 1911/12 drawing and the Flowering Apple Tree paralleled the change in conception between the first and second versions of the Still Life with Gingerpot II. 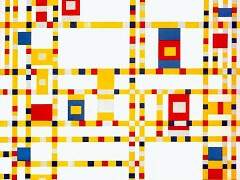 The Gray Tree is a little further along in that course of development than the first version of the still life; the factual qualities of the tree have already been converted into a rhythmic play of lines, leaving the thing-value of each part far behind. 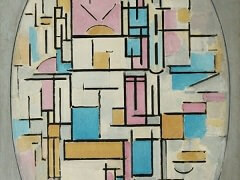 Nonetheless, a certain painterly quality is still an important factor in the appearance of this tree painting. It is an effect attained by vigorous brush strokes with smooth paint, and it has almost totally disappeared in the second version of the still life. 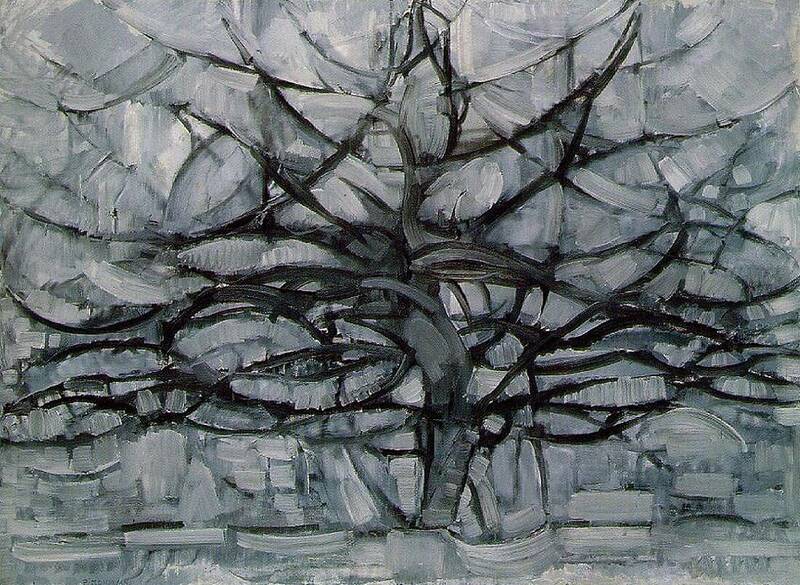 The Gray Tree, in turn, seems a major and successful effort to translate the drawing of a tree, which had itself been executed with a primarily compositional purpose, into a painting embodying the principles of cubism, which Mondrian had mastered for himself in the interim.